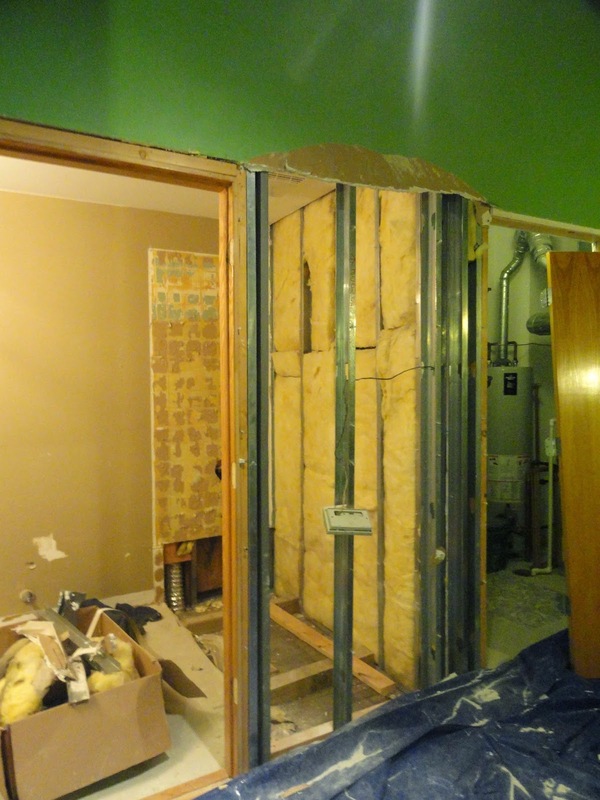 As we approach Month 3 of our bathroom remodel, the biggest jobs are nearing completion: the thermostat is moved, the pocket door kit is installed, some of the drywall is up. . .and the tub is in! Since we still have one last step to finish up before I write about the Nest and the "door" part of the "pocket door kit" left to install, I thought I'd spend a few minutes extolling on the intensity that was our tub install. You may recall our first surprise was finding out we had a cast iron tub on our hands. After demolishing it and recycling the pieces for a cool 24 bucks, we were left with a big open space. 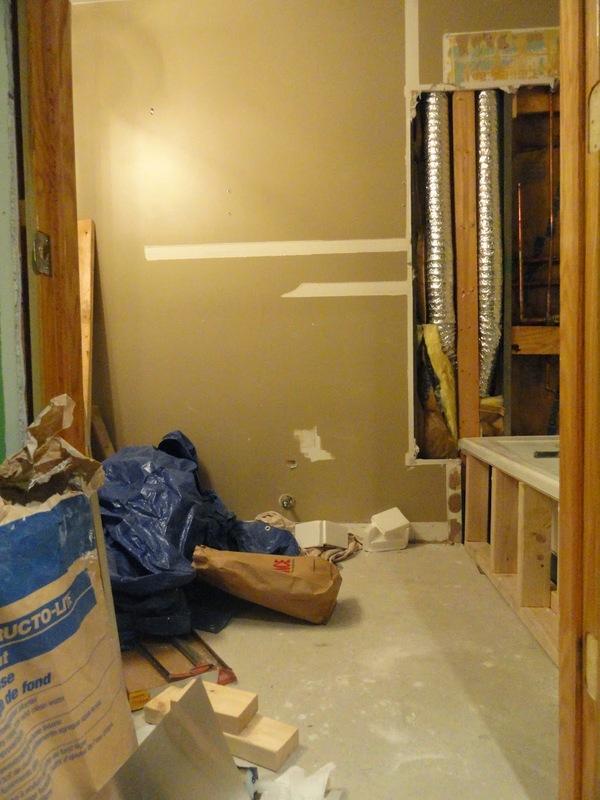 And somehow, out of the 194 photos of this remodel I've taken so far, I didn't get a close up shot of the open space left by the taken out tub! 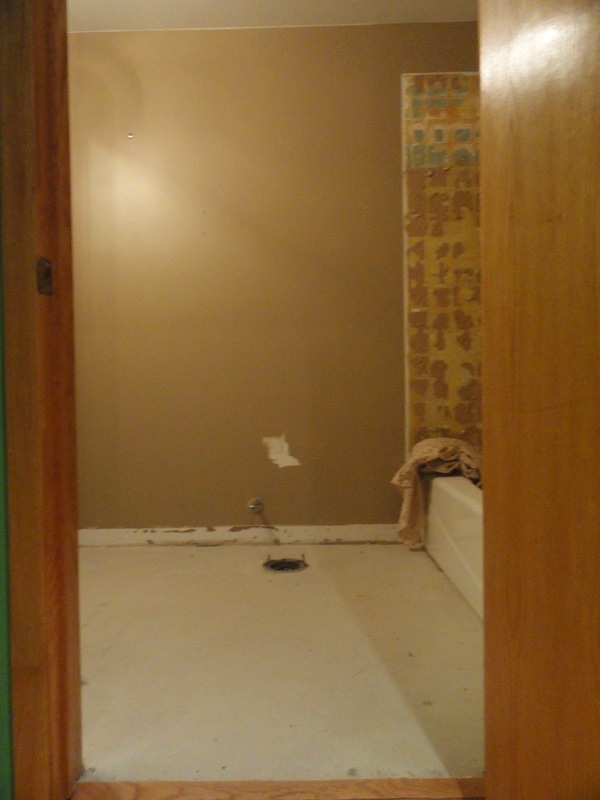 The weight of the tub meant it had nothing really holding it in place beyond the sealed in drywall edges. With our acrylic drop-in tub taking over the lease, this wasn't going to work. The instructions included info on how to set it in a mortar bed, so we knew that was our end goal. But first, the excitement of getting our drain pieces to fit. We purchased the Kohler Slotted Overflow and Bath Drain from eBay, saving about $15 from the same version available on Amazon.com. Moving from metal piping to PVC meant researching the connectors that were going to adapt the best way. In the end, we spent just a few dollars on a ring and grooved connector that created a tight grip on the metal pipe and allowed the pvc pipe to securely connect. The bigger issue was the height of the existing drain. 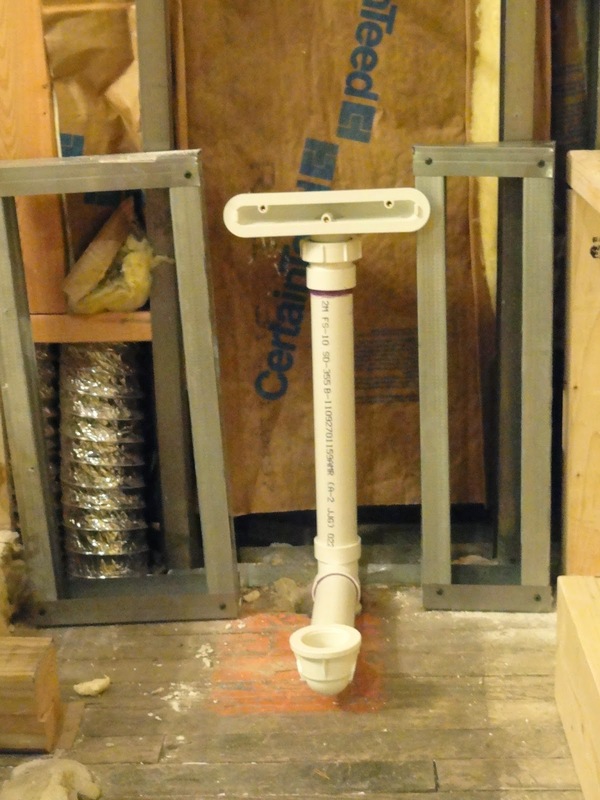 After quite a few "measure twice, cut once" tasks, we sliced down the metal pipe with a saw, cut a larger opening into the floorboard and sliced up the PVC pipes included with our kit to get the drain and waste overflow in just the right spot. After using Oatey purple primer and PVC cement to seal in the drain pieces, we used foam filler to fill in the extra space we created with our larger hole. In tandem with setting the drain in the exact right place, Bob was hard at work building a wooden frame for our drop-in tub. Three sides came together just fine, but when we realized that the 2x4s were a little too wide to fit in the tight space at the front end of the tub, Bob used some extra metal stud pieces to build out the fourth wall. These also helped make sure the drain kit wasn't blocked at all. After securing the frame to the floor and using some strategically placed 2x4s, the tub felt fully supported and was completely level. However, everything we read said that the frame itself should not be what is supporting the tub. That meant our next step was laying our mortar bed. Structo-lite was recommended by our local hardware store for this task, and 1 1/2 bags was enough to do the trick. How to ensure the mortar didn't spread all over or risk going down the drain? Bob built 2 "ears" alongside the drain using metal sheets picked up at Home Depot. 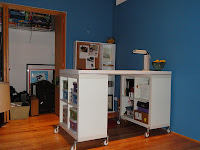 By screwing these and three other wooden walls into place, the bed was created. Bob mixed up the Structo-lite in our buckets with a drill attachment mixer and poured it over a sheet of polyurethane. After smoothing it out and making sure it was a tall enough mixture, the sheet of polyurethane was brought over the top and tucked into the edges of the barrier, creating a Structo-lite burrito. This meant that the tub would mold to the shape of the Structo-lite, but would not be completely stuck in the mud should we ever need to remove it. The tub was secured into place, the levels were checked (all good!) and then we let it sit overnight with a box of tile and bags of thinset stacked inside to give it some hefty weight. The Structo-lite hardened completely, and within the day there were no creaking noises at all when you stepped in the tub. With the tub in place and the drain draining just like we need it to, our next step involves covering the walls and side of the tub with cement backerboard before we tackle the tile! I've been taking photos every step of the way of our bathroom remodel, here's a quick snapshot of where we were to where we are now. Progress may be slow, but it is steady.